Draft: 2012, Washington Nationals, 1st rd. 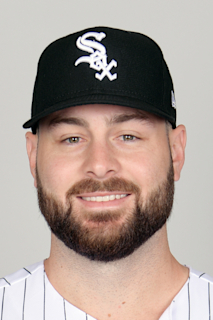 Married Ariana … Instagram: @lgio27 … Twitter: @LGio27 ... Is a 2012 graduate of Harvard Westlake High School in Los Angeles, where he was teammates with current major-leaguers RHPs Jack Flaherty (St. Louis) and Max Fried (Atlanta) ... Went 9-1 with a 1.00 ERA and 78 strikeouts in his senior season, tossing four complete games and three shutouts ... Parents Rick Giolito and Lindsay Frost are Hollywood actors … Rick has appeared in "As the World Turns," "Who's the Boss," "Hunter," "Jake and the Fatman," "Twin Peaks" and "Hit the Dutchman" … Lindsay acted in "The Ring," "Collateral Damage," "Without a Trace," "The Unit," "Boston Legal," "Crossing Jordan," "Lost," "Frasier" and "CSI." ... His uncle, Mark Frost, is a co-creator and writer of the ABC and Showtime drama "Twin Peaks" … grandfather, Warren Frost, played George Costanza's father-in-law, Henry Ross, on the award-winning sitcom "Seinfeld." five hits and seven walks over 2.0 IP ... Faced the minimum 17 batters through 5.2 IP on 5/2 at St. Louis before allowing a homer to pitcher Carlos Martínez ... Earned the win on 5/13 at the Cubs (3 ER/5.2 IP) … walked a career-high tying seven batters, hit a batter, threw three wild pitches and yielded five steals … became the third Sox pitcher since 2005 to win with seven-plus walks, joining Derek Holland (8/8/17 vs. Houston) and Gavin Floyd (4/13/09 at Detroit) ... Worked a career-low 1.1 IP on 5/24 vs. Baltimore, allowing seven runs on six hits (two home runs) and three walks ... Carried a no-hitter through 5.1 IP on 6/28 vs. Minnesota … pitched into the eighth inning for the first time in his career on 6/22-2 vs. Oakland ... Went 5-2 with a 3.82 ERA (26 ER/31.1 IP) over 10 starts from 7/8-8/30 … suffered the loss on 7/8 at Houston despite allowing just two runs on three his over a career-high 7.1 IP … worked 6.1 scoreless IP in a win on 7/15 vs. Kansas City ... Posted a ND on 8/3 at Tampa Bay despite allowing one run on two hits in 7.0 IP … carried a one-hit shutout into the eighth ... Earned his 10th victory on 8/25 at Detroit, allowing one run on three hits over 7.0 IP … retired 16 of the final 17 batters he faced, including 11 straight from the second-sixth … carried a two-hit shutout into the seventh on 8/30 vs. Boston ... After going 3-1 with a 3.86 ERA (16 ER/37.1 IP) and 40 strikeouts over six starts in August, fell to 0-4 with a 9.27 ERA (23 ER/22.1 IP) and 14 strikeouts over five starts in September ... Posted a no decision on 9/10 at Kansas City despite making his seventh straight quality start on the road (3 ER/7.0 IP) … lost his final start of the season on 9/28-2 at Minnesota, giving up seven runs over a career-low tying 1.1 IP (third time). Made 24 starts with Class AAA Charlotte and seven with the White Sox in his first season in the organization...Allowed three earned runs or less six times, two or less five times and one or less four with the Sox ...Recorded a 0.95 WHIP, .190 (31-163) opponents average, .645 opponents OPS and .190 BABIP...Limited right-handers to a .181 (15-83) mark … opponents were 3-26 (.115) with RISP and 1-15 (.067) with RISP/two outs...Was recalled on 8/23 and made his White Sox debut that night vs. Minnesota (4 ER/6.0 IP; 3 HR)...Went 3-2 with a 1.83 ERA (8 ER/39.1 IP), 30 strikeouts, a .177 (25-141) opponents average and 0.94 WHIP over his final six starts … five of the outings were quality...Earned his first win with the Sox on 8/27 vs. Detroit, allowing just three hits over 7.0 scoreless IP...Allowed one run and struck out a career-high 10 over 7.0 scoreless IP on 9/3 vs. Tampa Bay … became the first White Sox pitcher to strike out 10-plus batters within his first three starts with the club since Chris Sale in 2012... Received a ND on 9/13 at Kansas City, allowing one run on four hits in 6.1 IP … became the 15th Sox pitcher to make four-plus straight starts of 5.0-plus IP and four hits or less allowed...Earned the win in his final start of the season on 9/24 vs. Kansas City … allowed just one run on five hits over 7.0 IP...Began the season with Charlotte … at the time of his promotion, ranked among the IL leaders in shutouts (2nd), starts (T2nd), strikeouts (3rd), SO/9.0 (4th, 9.37) and IP (7th)... Made 10 quality starts, allowed two runs or less eight times and worked 7.0-plus IP in five outings … recorded double-digit strikeouts on 6/5 vs. Durham (11) and 7/8 at Louisville (10)...Went 3-1 with a 1.71 ERA (6 ER/31.2 IP), 28 strikeouts and just two home runs allowed over his final five starts... Threw his first professional no-hitter on 5/25-1 vs. Syracuse (7.0 IP), marking the first no-hitter in BB&T Ballpark history … … was named IL Pitcher of the Week for 5/22-28...Entered the season ranked by MLB.com as the No. 12 Prospect in baseball and No. 2 Prospect in the Sox organization...Entered the season rated by Baseball America as the No. 25 Prospect in baseball and No. 2 in the Sox organization … also tabbed as possessing the Best Curveball in the Sox system. Appeared in six games (four starts) over four stints with Washington in his first major-league season … made a combined 21 starts between Class A Hagerstown, Class AA Harrisburg and Class AAA Syracuse. His contract was purchased from Harrisburg on 6/28 and made his major-league debut that day as the starter vs. New York-NL … tossed 4.0 scoreless IP, allowing one hit with his first career strikeout (Asdrubal Cabrera). At the time of his promotion, ranked second in the EL in strikeouts per 9.0 IP (9.1), seventh in strikeouts (72) and ninth in ERA (3.17). Recorded four strikeouts in his second career start on 7/7 at the Mets (4 ER/3.2 IP) … was optioned to Syracuse following the game … was recalled on 7/24 and made his third start that day vs. San Diego (2 ER/3.1 IP) … was optioned back to Syracuse following the game. Was recalled a third time on 8/28 … suffered his first career loss that day vs. Colorado (4 ER/5.0 IP) … was optioned back to Syracuse following the game … was recalled for the fourth and final time on 9/6, making two relief appearances. Went a combined 6-5 with a 2.97 ERA (38 ER/115.1 IP), 116 strikeouts and a .239 (104-435) opponents average over his three minor-league stops … averaged 9.1 strikeouts per 9.0 IP and led all Nationals minor-leaguers in ERA. Earned EL Pitcher of the Week honors for the period of 6/6- 12, going 2-0 with a 0.69 ERA (1 ER/13.0 IP) and 20 strikeouts in two starts … struck out a minor-league, career-high 12 over 7.0 IP on 6/10 vs. Akron. Entered the season rated as the No. 1 Prospect in the Washington organization and the No. 5 Prospect in baseball by Baseball America … was ranked by MLB.com as the No. 3 Prospect in MLB in their preseason rankings. Following the season, was rated by Baseball America as the No. 5 Prospect and Best Pitcher in the Eastern League. Sox acquisition recommended by John Tumminia/Keith Staab. Combined to go 7-7 with a 3.15 ERA (41 ER/117.0 IP), 131 strikeouts and a .253 (113-447) opponents average in 21 appearances (19 starts) between Class A Potomac and Harrisburg … averaged 10.1 strikeouts per 9.0 IP and posted a 3.54 strikeout-to-walk ratio (37 BB) ... Ranked second among Nationals farmhands in strikeouts and fourth in ERA … was named a MiLB.com organizational All-Star ... Went 6-7 with a 3.55 ERA (41 ER/104.0 IP) in 19 starts, and 1-0 with 0.00 ERA (0 ER/13.0 IP) over two relief appearances... Was named to Team USA in the SiriusXM All-Star Futures Game in Cincinnati … started the game, allowing two hits with one strikeout over 2.0 scoreless IP... Was named the Eastern League Pitcher of the Week for the period of 8/10-16 … earned the win in his only start during that span, allowing just one hit and one walk while striking out 11 over 7.0 scoreless IP ... Went 4-1 with a 2.41 ERA (10 ER/37.1 IP) and 38 strikeouts over his last six starts with Harrisburg ... Entered the season ranked as the No. 1 Prospect in the Washington system by Baseball America and MLB.com … was also rated by Baseball America as the No. 7 Prospect in baseball and Possessing the Best Fastball and Best Curveball in the Nationals organization ... Following the season, was rated by Baseball America as the No. 1 Prospect in the EL and Carolina League. Was named Nationals Minor League Pitcher of the Year after spending the entire season with Hagerstown ... Was named South Atlantic League Outstanding Major League Prospect and Outstanding Pitcher ... Held opponents to a .197 (70-356) average … right-handers batted .175 (32-182) while lefties hit .220 (38-173) ... Limited opponents to a .130 (9-69) average with RISP and a .138 (4-29) mark with RISP/two outs ... Averaged 10.1 strikeouts per 9.0 IP (110 SO/98.0 IP) and recorded a 3.93 strikeout-to-walk ratio (28 BB) ... Earned SAL Pitcher of the Week honors for the periods of 6/23-29 and 7/21-27 ... Was selected to Team USA for the SiriusXM All-Star Futures Game in Minnesota … suffered a blown save, allowing two runs on two hits over 0.2 IP in relief ... Went 8-0 with a 1.82 ERA (10 ER/49.1 IP) over his last nine starts of the season ... Following the season, was rated the No. 1 Prospect in the SAL and named an All-Star by Baseball America … was named an organizational All-Star by MiLB.com ... Entered the season rated as the No. 1 Prospect and Possessing the Best Fastball and Best Curveball in the Nationals system by Baseball America. Combined to go 2-1 with a 2.21 ERA (8 ER/36.2 IP), 39 strikeouts and a .217 (28-129) opponents average over 11 starts between the Gulf Coast League Nationals and Class A Auburn ... Was rated by Baseball America following the season as the No. 2 Prospect in the GCL... Entered the season ranked by Baseball America as the No. 2 Prospect and Possessing the Best Fastball and Best Curveball in the Washington organization. Made just one start with the GCL Nationals before undergoing Tommy John surgery on 9/13 … the surgery was performed by Dr. Lewis Yocum... Was ranked by Baseball America as the No. 9 prospect in the draft … was signed by Mark Baca (Nationals). April 18, 2019 Chicago White Sox placed RHP Lucas Giolito on the 10-day injured list. Strained left hamstring. August 22, 2017 Chicago White Sox recalled RHP Lucas Giolito from Charlotte Knights. March 21, 2017 Chicago White Sox optioned RHP Lucas Giolito to Charlotte Knights. December 7, 2016 Chicago White Sox traded CF Adam Eaton to Washington Nationals for RHP Lucas Giolito, RHP Reynaldo Lopez and RHP Dane Dunning. October 14, 2016 Washington Nationals activated RHP Lucas Giolito. October 7, 2016 Washington Nationals reassigned RHP Lucas Giolito to the minor leagues. September 6, 2016 Washington Nationals recalled RHP Lucas Giolito from Syracuse Chiefs. August 29, 2016 Washington Nationals optioned RHP Lucas Giolito to Syracuse Chiefs. August 28, 2016 Washington Nationals recalled Lucas Giolito from Syracuse Chiefs. July 25, 2016 Washington Nationals optioned RHP Lucas Giolito to Syracuse Chiefs. July 24, 2016 Washington Nationals recalled Lucas Giolito from Syracuse Chiefs. July 16, 2016 RHP Lucas Giolito assigned to Syracuse Chiefs from Hagerstown Suns. July 12, 2016 RHP Lucas Giolito assigned to Hagerstown Suns from Syracuse Chiefs. July 8, 2016 Washington Nationals optioned RHP Lucas Giolito to Syracuse Chiefs. June 28, 2016 Washington Nationals selected the contract of Lucas Giolito from Harrisburg Senators. February 15, 2016 Washington Nationals invited non-roster RHP Lucas Giolito to spring training. July 25, 2015 RHP Lucas Giolito assigned to Harrisburg Senators from Potomac Nationals. May 5, 2015 RHP Lucas Giolito assigned to Potomac Nationals from Auburn Doubledays. August 23, 2014 RHP Lucas Giolito assigned to Auburn Doubledays from Hagerstown Suns. July 15, 2014 Hagerstown Suns activated RHP Lucas Giolito from the temporarily inactive list. July 12, 2014 Hagerstown Suns placed RHP Lucas Giolito on the temporarily inactive list. March 31, 2014 RHP Lucas Giolito assigned to Hagerstown Suns from Auburn Doubledays. August 19, 2013 RHP Lucas Giolito assigned to Auburn Doubledays from GCL Nationals. July 18, 2012 Lucas Giolito assigned to GCL Nationals. July 13, 2012 Washington Nationals signed RHP Lucas Giolito.